If so then we found the perfect gift for your fish. A Dalek aquarium ornament because even your fish love Doctor Who. 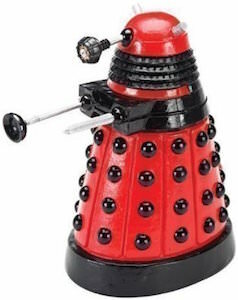 This red Dalek is 15cm tall and is specially made for in aquariums so no worries about being toxic to your fish. Just imagine having a Dalek in your fish tank I am sure that some people will look confused. And this Doctor Who aquarium ornament is officially licensed so you know it really close to have a real Dalek would look. I would say make your fish happy with this special Doctor Who Red Dalek Aquarium Ornament.